Canadians landfill about six million mattresses each year across the country. 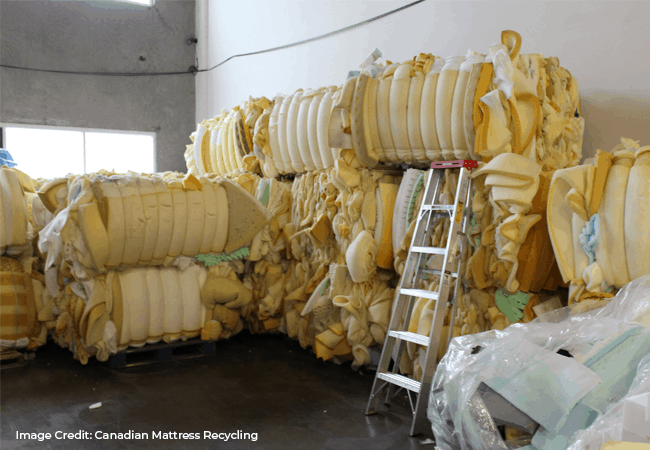 Some provinces have started supporting mattress recycling programs, but more still need to do something about mattress waste. In the provinces that do have mattress recycling programs, authorized recyclers take apart old beds, box springs, and more. They salvage materials such as foam, polyester, metal, and wood. The result? These facilities achieve a successful recycling rate of 95% to 100%. In 2011, Metro Vancouver placed a special levy on all mattresses taken to transfer stations. An extra fee encourages residents to seek other ways to dispose of their mattresses – such as recycling it. But fees aside, you might wonder — why should we even bother to recycle mattresses in the first place? 1. Mattresses take up space in landfills. Mattresses and old beds present a challenge for local landfills. Compared to other garbage, mattresses occupy 400% more space on average. Sometimes these issues of overcapacity lead landfills to increase their space or reject items. However, provincial regulations make it difficult for a landfill to go with these options. As a result, transfer stations try to send recyclable materials to recycling facilities. They already do this with metals, bottles, and organics. Sorting the waste, these transfer stations divert recyclable waste from landfills. For example, transfer stations in Vancouver and the Lower Mainland would set aside relatively clean mattresses. Then a recycler will take these beds and dismantle them for recycling. 2. Mattresses can wear down landfill equipment. Have you ever tried lifting a mattress? It’s pretty heavy, right? Now imagine hundreds of mattresses processing at landfills at any given moment. The weight and sheer size of these old beds can take a toll on landfill equipment, wearing them down faster. Landfill operators want to reduce the cost of these repairs, so sending these mattresses to a dedicated recycler is only logical. A mattress recycler could then properly process these mattresses using specialized equipment. 3. Mattresses take decades to decompose in a landfill. A mattress kept in good condition can be used for up to a decade or longer. So what does that mean after a mattress is dumped in landfills? For starters, landfilled mattresses take decades to decompose. Mattress makers have designed beds and box springs to last, so imagine how much longer it takes a mattress to decompose in a landfill. Sources say it can take up to a century or longer for a mattress to fully decompose. Plastic components from mattresses including foam can take even longer to return to the earth. 4. Decomposing mattresses release toxic chemicals in landfills. 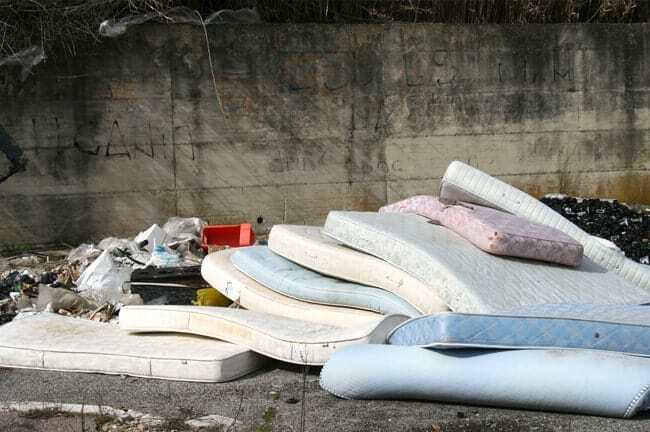 When mattresses decompose in landfills, they slowly release toxic chemicals. The chemically treated portion of mattress foam and fabric react with the natural elements. Chemically treated headboards release those chemicals as they decompose. Although wood makes up most of these box frames and boards, manufacturers would have finished the wood chemically. Also, exposed metal springs from frames begin to corrode in wet and rainy weather. The toxic sludge then collects in the landfill’s soil, seeping into the ground or running off the site. Eventually, chemicals from these old beds end up in our water systems and pollute our environment. 5. Repurposing a mattress saves valuable materials from the landfill. The 95% to 100% success rate of most mattress recycling programs speak for themselves. Diverting mattresses from landfills often means reclaiming high-quality materials such as coir, foam, metal, and fabric. Materials once destined for landfills can be reused into new products. However, reclaiming a mattress is no easy task. Some recyclers specialize in dismantling mattresses, which require them to know the best way to salvage materials for reuse. 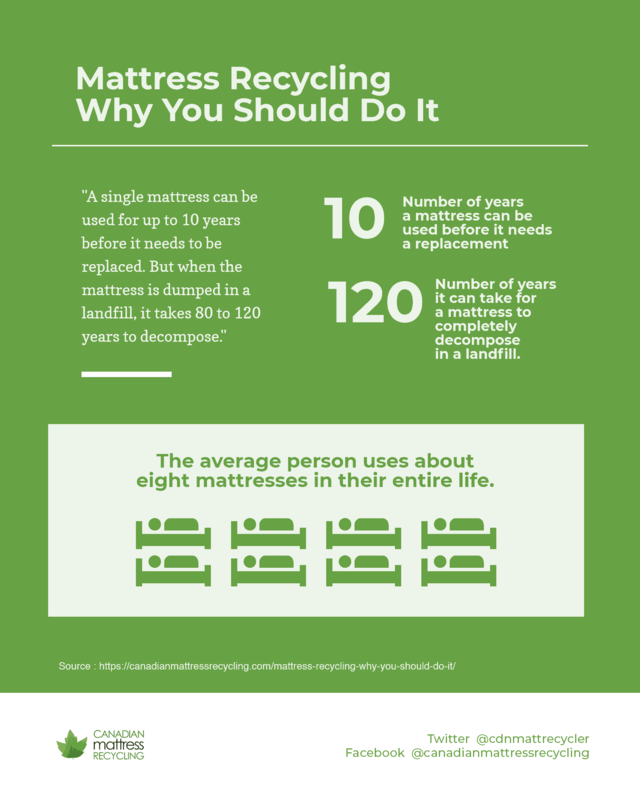 Now that we’ve covered why mattresses should be recycled, let’s delve into the how. In general, mattress recycling is a time consuming and labour intensive process. Labourers strip mattresses apart and a variety of recycling equipment is used to sort and compress the individual components. But first, recyclers inspect the beds and box springs they receive. They determine what mattresses can and can’t be recycled. The ones that can’t – for example, those with bed bugs, mould, or are soaking wet – are turned away. This is done to avoid contaminating the existing mattresses in their facility. Since many of the salvaged materials are sent to manufacturers for reuse, these reclaimed materials must be of high quality. If they are of low quality, manufacturers won’t take them. After dismantling a mattress, individual materials are sorted and set aside. The recycling centre dismantles the bed after the inspection. Most of the time, bed frames and mattresses come in separated, so the staff do not have to worry about that. In fact, they focus on stripping away the layers of a mattress, sorting the components for recycling. You may ask – what happens to the materials they recycle? It varies from recycler to recycler. For example, we set aside clean wood and materials such as polyester and coir at Canadian Mattress Recycling. We make these materials available for residents to use by donation, or to take for free. We donate what we earn from these donations to environmental charities working to make our world a more sustainable place. What Can Mattresses Be Recycled Into? Throughout the years at Canadian Mattress Recycling, we’ve seen many creative uses for materials dismantled in our facility. Residents, DIYers, and makers find brilliant ways to reuse the wood, foam, and fabric we set aside. Mattress recyclers can take wooden bed frames and dismantle them for reuse. 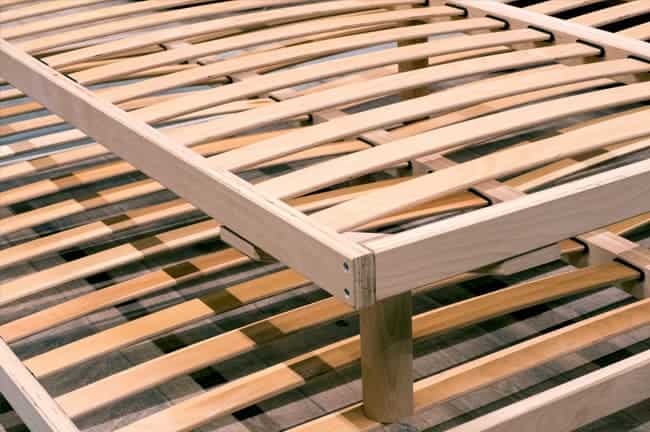 Manufacturers make mattress bed frames from softwoods like pine. Once salvaged, pine becomes a clean and easy wood for reprocessing. Carpenters make home décor and furniture out of pine. From shelves to tables to boxes, carpenters turn wooden bed frames into works of art. Likewise, farmers chip the wood apart, using sawdust and wood chips as mulch for their farms. Recycled wood achieves similar results as products made from virgin wood. Carpenters seek mattress bed frames to dismantle over industrial pallets. Why? Because it is difficult to tell where an industrial pallet comes from, or how it has been used in the past. Vancouver makers often work with reclaimed wood. Reclaimed wood can be cheaper than virgin wood, so people often gravitate towards these materials. Of course, anything these carpenters make from reclaimed wood speaks volume about sustainability and environmental conservation. A large component of mattresses is foam. Some mattresses these days are made entirely out of foam – no metal springs, coir, or fabric. Just foam. Not only is foam comfier, foam mattresses are also easier to transport during purchase and moves. But, when you need to replace a foam mattress, what happens to it? Foam is traditionally repurposed into carpet underlays. They’re also recycled into high-density foam chips and car-wash sponges. Some interesting projects we’ve come by include turning foam into mats for martial arts studios. Nowadays, recycled cotton finds its way into sustainable apparel. They are recycled and deconstructed, turned into the new building blocks for clothes and accessories. But did you know recycled cotton also has industrial uses? Many industrial oil filters are made out of recycled cotton. This helps reduce waste and extends the lifecycle of these materials. Recycling cotton supports the textile waste recovery industry since farming and making virgin cotton takes significant water and energy resources. The textiles industry is one of the biggest polluters in the world – so recycling cotton helps minimize the environmental impact. Cotton farming also requires significant use of pesticides, which harm soil, plants, and ecosystems. Even though cotton is a biodegradable material, it is a sustainable practice to recycle as much as we can so fewer virgin cotton is used. Scrap metal can be melted down into new products. Copper, lead, aluminum, stainless steel, zinc. All metals can be smelt and reformed into new products instead of thrown away in landfills. If landfilled, these metals contaminate our soils and water supply when they degrade and rust. Canadian Mattress Recycling is Vancouver’s most trusted mattress recycler. Our recycling centre on Annacis Island, Delta BC is open seven days a week for mattress and furniture drop-offs. To book a residential pickup, visit our booking page. To check out our other blog posts, click here.